I was in Kotzebue for three days, visiting Maniilaq Association, the health care clinic in the community. Coincidentally I was in town the night of June 21, which is the summer solstice, the longest day of the year. The geographic location of the city of Kotzebue rests 33 miles north of the Arctic Circle on Alaska's western coast. All areas north of the Arctic Circle experience at least one 24 hour continuous period when the sun never sets. Therefore, this area also experiences at least one 24 hour continuous period when the sun never rises (Winter Solstice is December 21). In Kotzebue, the sun rose on June 3, 2010 and did not set until July 10, 2010. 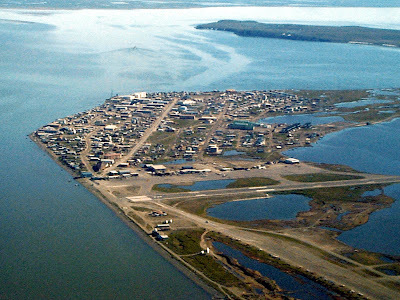 An aerial view of Kotzebue. Kotzebue lies on a 3 mile gravel spit at the end of the Baldwin Peninsula and has a population of about 3,000 residents, 70% of whom are Alaska Natives. 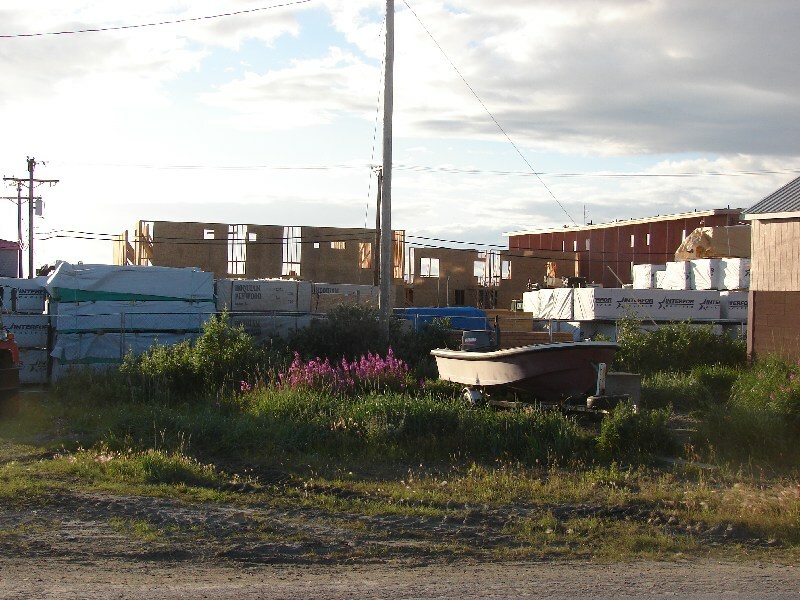 Archaeological evidence indicates that Inupiat people have lived around the area for about 600 years. Kotzebue was originallly named "Kikiktagruk" which means "almost an island" in Inupiaq, the language of the Inupiat people, referencing the spit. The name of the town was later changed to Kotzebue after the Kotzebue Sound, which was named after Otto von Kotzebue, who explored the sound in 1818, searching for the Northwest Passage. von Kotzebue was in the service of Russia. Three rivers (Noatak, Selawik, and Kobuk) drain into the Kotzebue Sound near Kotzebue, forming a center for transportation to points inland. Because of the location, Kotzebue was a trading and gathering center for the entire area. In addition to people from interior villages, inhabitants of the Russian Far East came to trade furs, seal oil, rifles, ammunition, and seal skins at Kotzebue. The population of Kotzebue expanded as whalers, traders, gold seekers, and missinonaries arrived at the trading area. In 1897 reindeer herding was introduced to the area. Although much of Alaska had caribou, the wild form of reindeer, the domesticated animals were brought to Alaska from Asia. The Nullagvik Hotel...the only hotel in Kotzebue. 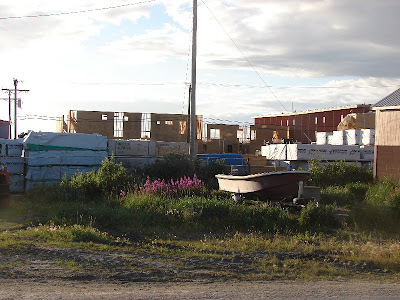 Owned by NANA (Northwest Arctic Native Association) the regional corporation for Kotzebue and ten (10) other villages, a new hotel is being built right next to the current hotel. Once the new hotel is built, the old hotel will be demolished. The streets of Kotzebue...where ATVs are a popular mode of transportation in both the summer and winter. ...or three snow machines?? in the summer?? I was lucky to have Carla travel with me to Kotzebue and we were lucky to experience gorgeous weather the entire duration of our trip. One afternoon we took a walk on the beach...along the waters of the Kotzebue Sound, an arm of the Chukchi Sea, which is north of the Bering Straight and a marginal sea in the Arctic Ocean. ...touching the waters of Kotzebue Sound/Chukchi Sea/Arctic Ocean, which is ice-free from early July until early October. The Chukchi Sea is named after the Chukchi people, indigenous Russian people who reside on the Chukchi shores and have depended primarily on fishing, whaling, and hunting walrus. one of only two restaurants in Kotzebue, both of which specialize primarily in Chinese food. Let me just say that after being in Kotzebue for three days, I do not eat Chinese food for months. The Ralph Wien Memorial Airport. Notice the paved runway across the middle of the picture. The gravel road in the forefront of the picture lies adjacent to the coast and actually loops around about ten miles, connecting to the other side of Kotzebue, making up much of the road system around Kotzebue. The following pictures are from when I visited Kotzebue for the first time in the fall of 2008 with my former co-worker Christine.